The unconventional, yet potentially lucrative solution was developed by scientists from CU Boulder, the University of Copenhagen, Arizona State University and the Rhode Island School of Design. Their findings were published today in the journal Nature Sustainability. "The melting Greenland Ice Sheet delivers an enormous amount of sediments to the coast," said Mette Bendixen, a researcher at CU Boulder's Institute of Arctic and Alpine Research (INSTAAR) and a Carlsberg Foundation research fellow. "Eight percent of the annual sediment contribution delivered to the global oceans comes from the Greenland Ice Sheet and with continued global warming, this number is expected to increase." Simultaneously, global sand reserves have been rapidly depleted in recent decades while demand has only increased thanks to global urbanization and infrastructure investments. The study estimates that the amount of sand delivered to Greenland's coast each year has a market value equivalent to more than half of the Greenland gross domestic product ($2.22 billion in 2015) and this value is expected to double within the next 25 years if the global sand prices continue to increase. "With this work, we present a rare example of economic opportunity brought to life by climate change," said Irina Overeem, a CU Boulder associate professor and INSTAAR research fellow. 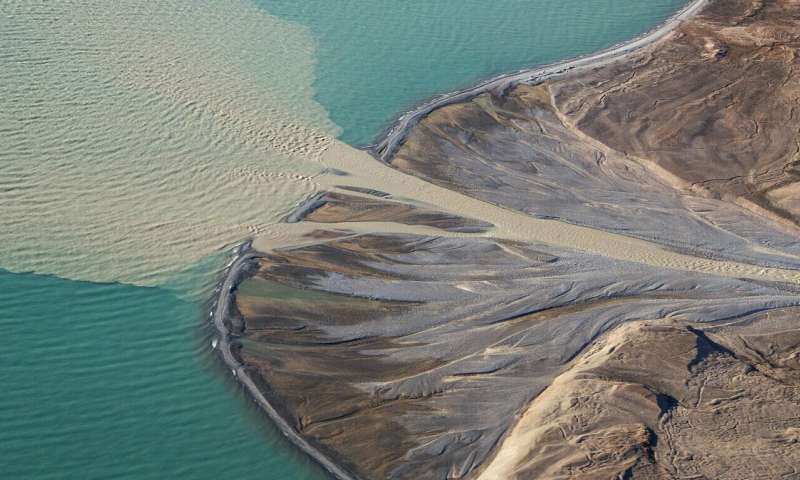 "When we started our research, we had no idea that our results would foster the idea of establishing a sand mining industry in Greenland," said Lars L. Iversen, a research fellow at Arizona State University's Julie Ann Wrigley Global Institute of Sustainability. "It just shows how unpredictable science can be and how we constantly have to think about how our work contributes to solve the global challenges that we face." These materials will be exported for use in mixing concrete, which itself is responsible overall for at least 10% of man-made CO2 released globally? Sounds like a very self-sustaining business model.